Parker River knives are beautiful and useful tools that are cherished for their classic look and modern performance. You can customize our products with personalized engraving, creating a unique and special knife. We will laser engrave your desired inscription onto the wood sides of the knife. 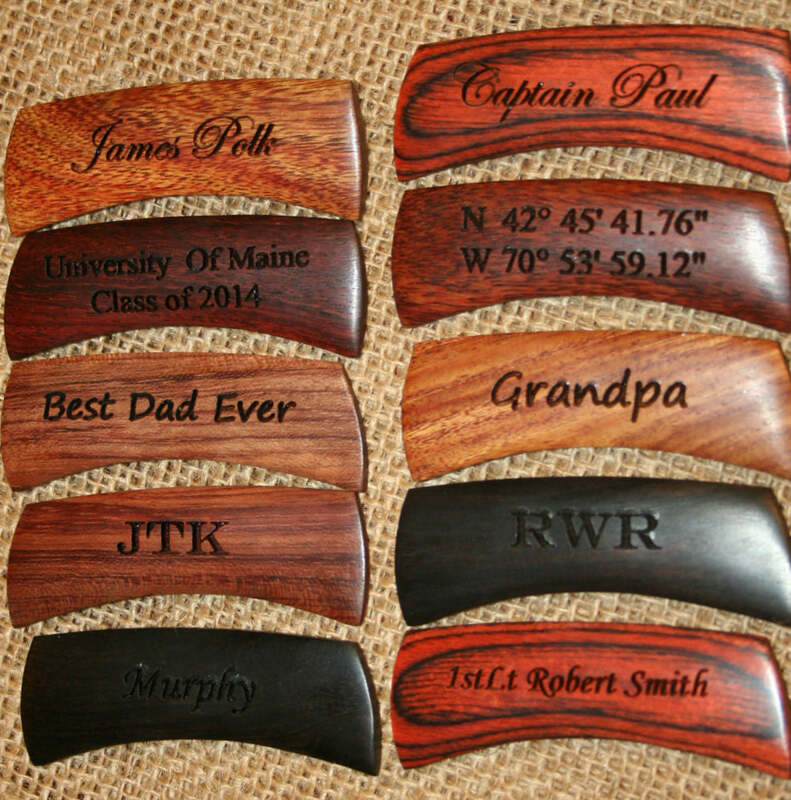 Laser engraving creates a beautiful inscription within the wood that will last a lifetime. Please see the images on this page for samples of the various fonts that you can select. If you have any special requests, like engraving on the front and back, adding images, etc... Please contact us via email and we will do our best to create your perfect knife. 1. On each product page you will see an option to add text for engraving. Enter your desired text in this field. 2. Select the desired font. 3. Add item to shopping cart. If you want to order multiple knives with different inscriptions, click the continue shopping button, this will return you to the product page and you can add the next item to your cart. If you have any questions about engraving, please call or email us. We have carefully selected Fonts that will look good on our products. If you would like a Font that is currently not listed as an option, please call us to discuss. 1. Our favorite scheme is either a full or last name with the Monotype Corsiva font. 2. Engravers font is all caps and looks good with initials. 3. Script font does not look good with all capitals. 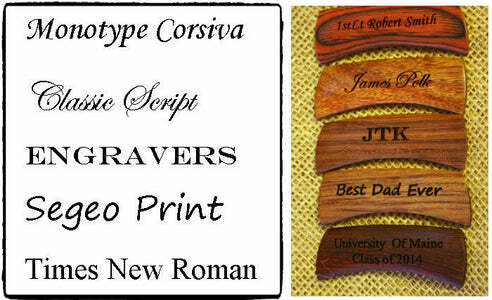 If you request the Script font and have listed the engraving with all capitals, we will change it to make it look good. 4. Segoe Print font is a fun , informal option. This looks good with first names. 5. Times New Roman is a good all-around choice. 6. The engraving area is about 2” wide, if your text is too long, we will push part of it to a second line. When this happens, we center justify. We try to not separate names on multiple lines. But often we have requests for a name and a date. In that case, the date would go on the lower line.